There’s more to off-road tires than sheer size and aggressive styling. Tire manufacturers spend hundreds and even thousands of hours finding the right rubber compounds and testing behavior in a variety of situations to create superior off-road designs. 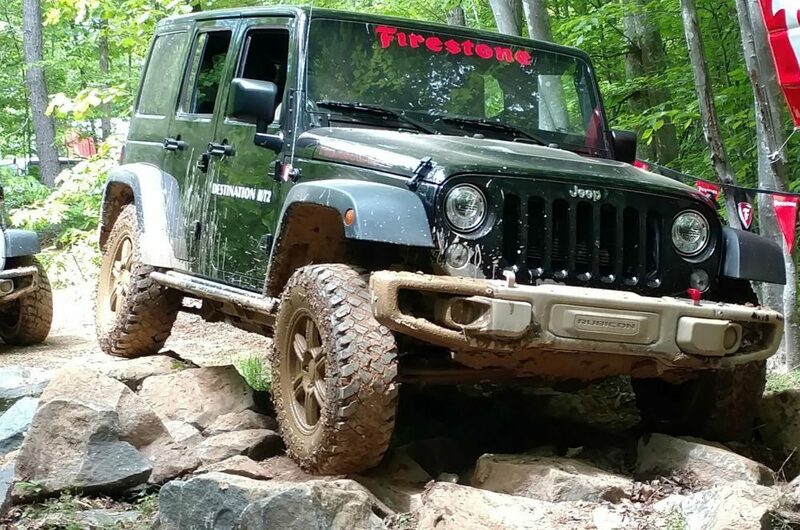 Recently, I had the chance to get behind the wheel and do some testing of my own in Virginia and see just how much capability a dedicated off-road tire adds to your Jeep. As with many off-road-specific upgrades, there’s a lot of performance to be had here. The trick is knowing how much on-road drivability you’re willing to sacrifice for better performance on the trail. #1 – What size and width tire will you use? Let’s start with an easy one. Are you planning on keeping the stock size and aspect ratio tires that came with the Jeep? Answering “yes” here will preserve maximum on-road drivability. However, you can unlock a lot of off-road potential by mounting up some beefier tires. You also need to consider clearance. That is, when you turn the wheel lock-to-lock, will your new tires rub on the inner fender well of your Jeep? Here’s how to read the size ratings on tires, so you’ll have an idea of how models compare. If you’re installing tires as part of a lift, chances are you’ll need to choose something larger than stock to keep the Jeep from looking like it’s on stilts. The added size will also allow you to roll over rocks and obstacles more easily. Taller tires will probably be wider as well — which means more grip on the trail, but more fuel burned on the road. #2 – How much pavement driving do you plan to do? What could possibly look cooler than a set of 40-inch mud-slinging paddle tires? The problem is, these are going to wear down really quickly on the road — and that means you’re out more money for tires and gas. This is the reason many factory four-wheel drive vehicles like Jeeps come with all-terrain tread pattern tires. For the Jeep that spends most of its time on the road and might hit the trials on an occasional weekend outing, these work equally well on rocks, mud, or snow. They aren’t ideal for any specific terrain, however. If your Jeep is going to be primarily an off-highway vehicle, you have a little more freedom to mount some dedicated off-road rubber. Read my detailed review of the new Firestone Destination M/T2 tires. As I mentioned in my review, these off-road tires aren’t for everyone. While we didn’t have time to test them on pavement, I would expect them to generate more road noise and impact fuel economy more drastically than a standard all-terrain radial tire. For rigs that will never see on-road use, you can find even more aggressive treads. #3 – How often do you plan to hit the trails? The biggest difference I noticed in testing the more aggressive M/T2 against other tires was the way it performed in mud. The specially developed rubber compound and off-road-specific tread pattern combined to make the Jeep Rubicon I was driving feel much more sure-footed in the sloppy stuff. We even tackled a few crossings, and the Jeep never felt unsettled. This type of performance isn’t something you need if you only plan to engage four-wheel drive during the occasional trip to the ski hill. You would be better off keeping your factory tires and saving money in that case. If, however, you have a job that requires you to access technical terrain or getting out and running trails is your hobby, then the selection of a more dedicated tire is going to help you be more confident off-road. Off-road tires could also make the difference between easily overcoming an obstacle versus spending lots of time hunting for traction — or even damaging your Jeep. Here are some more great tips for choosing off road tires.